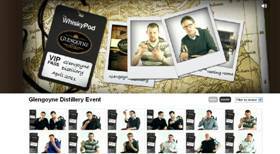 16 May 2011, Glengoyne: Following a successful debut at The Whisky Show and Whisky Live London, connosr.com, the social network for whisky lovers, took their video review booth - the WhiskyPod - on the road for an exclusive event, hosted in partnership with Glengoyne distillery. A lucky group of 25 Connosr members were treated to a VIP visit to the distillery and a tasting of some very special whiskies. The tasting was the first time that a Connosr event has been hosted in partnership with a distillery and to celebrate Glengoyne provided some of it oldest, rarest and most special bottlings including the Glengoyne 40 Years Old. The VIP guests also tasted, amongst others, the award winning 17 Years Old and 21 Years Old from the core range and the 23 Year Old Single Cask. Pierre Thiebaut, founder of Connosr.com said: “Glengoyne has been a loyal supporter of Connosr since it was created, spotting the potential of the online whisky community early on, so it seemed fitting that our very first exclusive event was in partnership with Glengoyne and its team. “We knew that, while they are quite traditional in the way they make whisky, they are very forward thinking in they way they communicate. As such we thought they'd make an excellent partner for the first bespoke WhiskyPod event. And we weren't wrong, they pulled out all the stops and it was a great evening. “Our members who attended on the night thoroughly enjoyed the event and the feedback we had was excellent - there was a real buzz about the evening. Everyone was blown away by the selection of whiskies. The response since has been terrific, the videos from the night are a high traffic area for us at the moment so, all in all, it's been an unqualified success." For more information on Glengoyne and future events see www.glengoyne.com Follow @TheGlengoyne or visit the Facebook page.